The current avalanche danger for the West Central Montana backcountry is Moderate. Widespread small avalanches with isolated larger slides will give way to more widespread avalanche activity as the day warms. The danger could reach considerable by the afternoon making natural avalanches possible. Careful route-finding and cautious snowpack evaluation are critical for backcountry travel today. Good morning, this is Logan King with the West Central Montana Avalanche Center’s avalanche advisory for Saturday, March 23rd, 2019. This danger rating does not apply to operating ski areas, expires at midnight tonight and is the sole responsibility of the U.S. Forest Service. Mountain temperatures early this morning are hovering right around freezing across the region. Winds are out of the West at 8 mph and gusting to 15 mph. No precipitation fell overnight for the forecast area. Loose wet avalanches continue to be the most widespread and reactive problem today. Although temperatures will be slightly cooler today than earlier this week the warmer temperatures overnight have increased the reactivity of the surface snow. Widespread small loose wet avalanches will occur today with some potentially entraining large amounts of snow and becoming destructive. Avoid terrain traps and steep rocky areas or other trigger points in the mountains today. The warm temperatures are now also creating wet slab avalanche problems. Wet slabs avalanches are a result of the snowpack becoming saturated and losing strength. The prolonged warm temperatures have finally reached a tipping point where the snowpack is saturated and susceptible to failure. Wet slabs are notoriously difficult to predict and have the potential to take the entire season snowpack out in a single slide. This is a particularly dangerous combination so if the snow surface is wet and heavy or the snow has become saturated seek out colder drier snow at higher elevations or colder aspects. Bottom Line: Our luck has run out and we no longer have the cold overnight temperatures that were refreezing the snowpack. The good news is that this has diminished the wind slab and persistent weak layer concerns but has created a new problem of wet avalanches. Wet avalanches are very hard to predict and are best mitigated with timing and choosing appropriate terrain. Milder but still warm temperatures today will have a minor chance for sporadic snow flurries but will usher in more precipitation on Sunday (forecast). Any snow we get will add weight and stress to the snowpack and will have fairly high rain lines around 5-6 thousand feet. 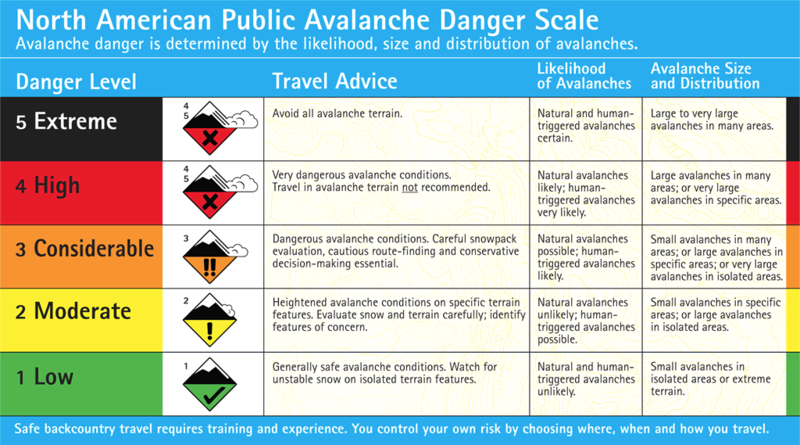 The avalanche danger will continue to trend upward throughout the weekend. Next week has the chance to bring freezing temperatures overnight again which will help to settle the snowpack. With changing conditions public observations become crucial. If you are out in the mountains please share your observations on our public observation page. Large destructive wet slab avalanches are becoming increasingly possible with warming temperatures. Loose wet avalanches are likely with some potentially becoming large and dangerous. Warm and partly cloudy with isolated showers leading to snow by late Sunday.